Carrots are easy to grow in the cool days of spring. Carrots even come in colors other than their trademark orange color. I was surprised to learn that wild carrots were originally purple. For fun, grow a purple, yellow, or white carrot. You might want to try the All America Selections committee awarded Purple Haze carrot. The award means it has been trialed and is easy to grow in most areas of the country. Carrot Scarlet Nantes, a deep rich red-orange, is an old standby from gardens and markets past. Loose soil is key for growing carrots, so they can extend their roots deep into the ground. If you don’t have the perfect carrot soil, don’t be discouraged. Use a large pot filled with good soil, deep enough to allow the carrot roots to grow straight and long. Sprinkle the carrot seed on top and filter loose soil over the seed to a depth of ¼ to ½ inch deep. Either in the ground or in a container make sure you keep the soil moist with gentle watering. Using mulch over the bed will help keep down weeds and hold moisture in the soil. If you are working in soil that contains a lot of clay or rocks, then you can plant the short, round carrots. Paris Market is a round heirloom. The heirloom Danvers also does well in clay. Carrot seedlings look like tiny twin blades of grass when they first emerge. They will develop their lacy tops as they get a little bigger. Since carrot seeds are slow to come up, plant radish seeds, which fairly jump out of the ground, in the same row with the carrot seed. These will mark your row so you know where the carrots are and help to thin the carrots as you pull the radishes. 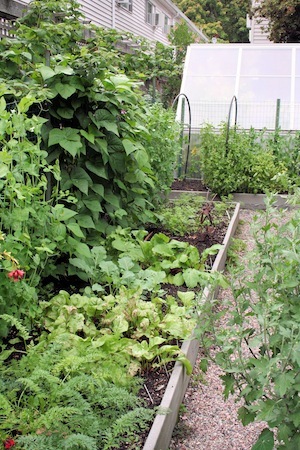 If you plant them in the garden, the rows should be 1 ½ to 2 feet apart. In a container, sow sparsely and thin as with garden grown carrots. You should thin your carrot seedlings in the row to 2-4 inches apart. Give each little carrot room to grow full and straight. You can leave them closer together at the first thinning. Then, when baby carrots are forming, thin the row again and use the young carrots in the kitchen. Depending on the variety and the vagaries of early spring weather, you can expect to harvest carrots in 50-100 days. Think of all those extra holiday pounds you will be losing as you keep your carrots weed-free and watered. The carrot harvest will be a bonus to your weight loss plan.